Turkish troops have taken control of 11 Kurdish positions and created “safe zones” in neighbouring Syria’s northwestern region of Afrin, according to Turkish media. Reports on Tuesday said the army, aided by Free Syria Army rebels, is pushing towards the southern part of the Syrian region with fronts on the west and the east. 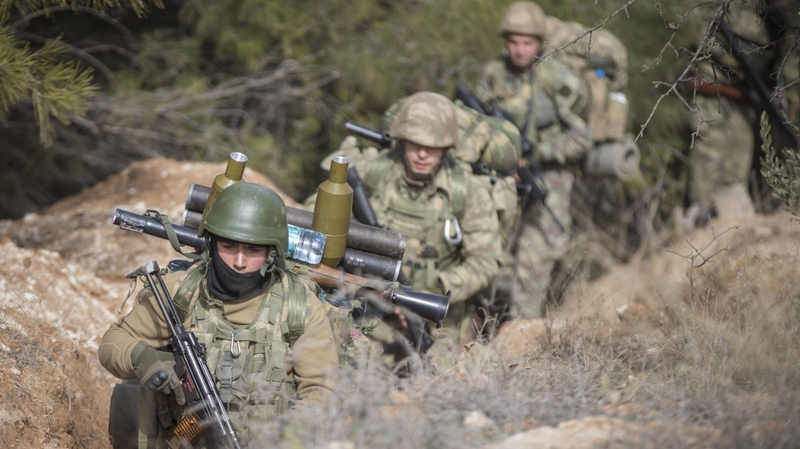 The Turkish army, which launched the Afrin operation on Saturday, captured the villages of Shankal, Qorne, Bali and Adah Manli, as well as the rural areas of Kita, Kordo and Bibno and four other hills in Afrin, Turkish daily Hurriyet reported. State-run Anadolu news agency said that the forces launched a second front towards Afrin from Syria’s Azaz on Monday to squeeze the People’s Protection Units (YPG) – a Syrian Kurdish force – from both west and east in order to advance on southern Afrin. Turkey sees the YPG as a “terrorist group” that acts as the Syrian offshoot of the Kurdistan Workers’ Party (PKK), which has waged a bloody three-decade fight against the Turkish state. Turkey’s military announced its first fatality of the campaign after a soldier was killed in clashes with the YPG southeast of the border town of Gulbaba. The UK-based Syrian Observatory for Human Rights said a total of 22 Syrian civilians have been killed by Turkish attacks and two more by Kurdish fire during the operation. It said 54 Syrian fighters were killed, including 19 Ankara-backed rebels, 26 Kurdish fighters and nine unidentified figures. Ankara has denied inflicting civilian casualties, with Foreign Minister Mevlut Cavusoglu accusing the YPG of sending out “nonsense propaganda and baseless lies”. The UN Security Council discussed Turkey’s offensive and the worsening humanitarian crisis in Syria on Monday but did not condemn or demand an end to the Turkish operation. US Secretary of State Rex Tillerson, while visiting London, said he was “concerned” about the offensive, and EU diplomatic chief Federica Mogherini said she would discuss the situation with Turkish officials. But Turkish President Recep Tayyip Erdogan expressed impatience with US demands to set a clear timetable, saying the campaign would be over “when the target is achieved”. “How long have you been in Afghanistan? Is that over in Iraq?” he said, referring to long-running US military presence in those countries. Erdogan has previously indicated that once control is imposed in Afrin, Turkey wants to head east to defeat the YPG in the town of Manbij. Meanwhile, Russia and Iran – who have a military presence in Syria and are working with Turkey on a peace process – have also expressed concern. Erdogan insisted Turkey had discussed the operation in advance with Russia, and Moscow was in “agreement”. Previous article How Do You Know Your Partner Is Cheating?